The Discovery, Documentation and Destruction of Sennacherib's Palace at Nineveh, Iraq. The "final sack" of Nineveh is its modern-day destruction by air pollution and looting. In 1989 art historian and archaeologist Russell documented the palace, through early excavation images and his own photographs, in its now-lost glory. In the "Palace without Rival" at Nineveh, the Assyrian King Sennacherib immortalised his 701 B.C. campaign against Jerusalem with a series of spectacular wall relief sculptures. Amazingly, when the palace was rediscovered twenty-five centuries later in 1847, the sculpture in the throne room areas remained largely intact. But today, air pollution, animal damage, vandalism, neglect, and - worst of all - looting for the international antiquities market by Iraq's own sanctions-striken people, have brought ruin to the palace. The splendour of Sennacherib's palace now survives only in this irreplaceable book. Art historian and archaeologist John Malcolm Russell, who in 1989 set about creating the only extensive photographic record of the palace architecture, sculptures, and inscriptions ever made, has preserved in pictures much that has since been lost. This book is not only a major contribution to the understanding of Assyrian palatial art and architecture, it is also the key to safeguarding the treasures of Sennacherib's palace and other ancient sites, for Russell proposes standards in archaeological excavation, documentation, and public policy that will help preserve cultural artifacts in an unstable world. 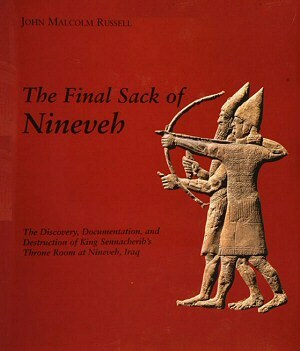 The Final Sack of Nineveh - Amazon's online bookstore.